You've waited a long time for your family vacation and now that it's here, discover award-winning lodging in Branson, MO at the Best Western Center Pointe Inn! Enjoy clean, cozy rooms with many amenities including cable television, a coffee maker, and free wireless Internet. Wake up each morning and delight in a complimentary full breakfast, including scrambled eggs, sausage, waffles and more. After a great day exploring the area, you'll be happy to head back to this Branson hotel to take a dip in the sparkling indoor and outdoor pools and relax in the hot tubs. Get even more value out of your stay with access to an exercise facility, a gift shop, free parking and guest computers. 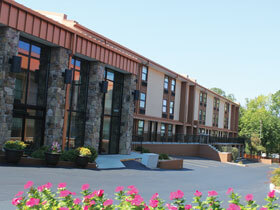 “Best Western Center Pointe Inn” is also home to three electric car charging stations.